Three lucky nurse scholars will each win $1000 toward their education costs. Educating tomorrow’s nurses is crucial in combatting the nursing shortage and creating strong nurse leaders and educators who will sustain the field and provide great patient care and leadership in the future. 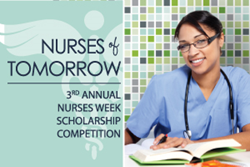 Medical Solutions, the nation’s third-largest travel nurse staffing company, kicks off its third annual Nurses of Tomorrow Scholarship Essay Contest May 6, 2014. “Educating tomorrow’s nurses is crucial in combatting the nursing shortage and creating strong nurse leaders and educators who will sustain the field and provide great patient care and leadership in the future,” says Medical Solutions Clinical Director of Nursing, Amber Barna. The scholarship competition runs from May 6 (midnight CST) through June 6 (11:59 p.m. CST), 2014. Click here to learn more about and/or to enter Nurses of Tomorrow, Medical Solutions’ third-annual Nurses Week Scholarship Competition.